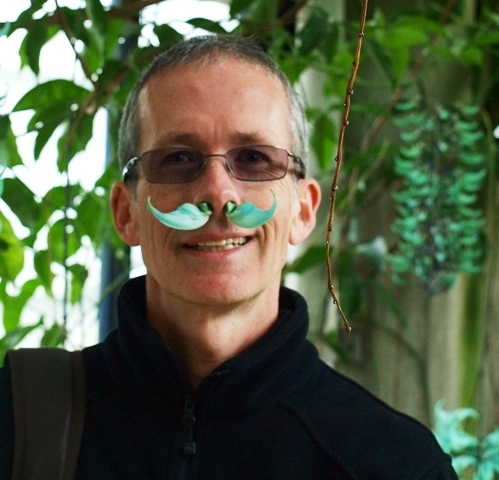 But first, where do we grow the best turquoise moustache in Kew? There is a robust competition between the Palm House and the Princess of Wales Conservatory and this year, the POW as we call it within Kew, has won! As many of you would know, this plant is the Jade Vine, Strongylodon macrobotrys. As Kew's website explains, it is under threat in its native habitat in the Philippines due to the destruction of rainforest around the streams and rivers where it grows. 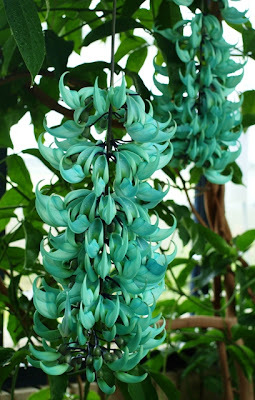 The beak-like flowers tell you it's a member of the pea family (Fabaceae or Leguminosae) along with things like...well peas and beans. In fact its closely related to kidney and runner beans. Again from our website, I learn that Kew only got its first seed from the climber in 1995, although it had been growing the species for more than 30 years. Led by some careful observations by our Jodrell scientists, we can now do what bats do naturally and pollinate it. 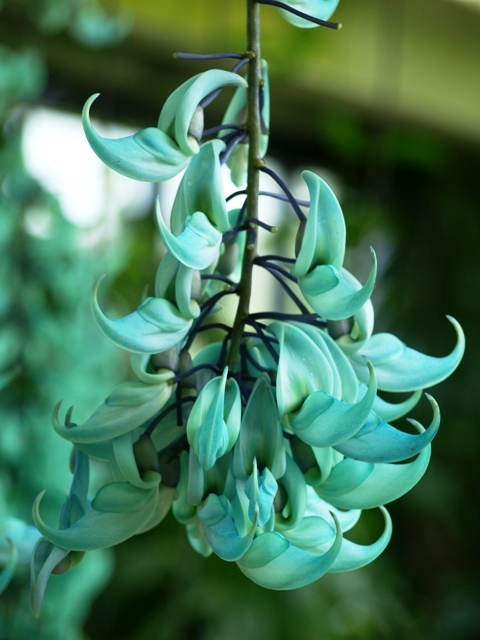 The flowers are luminous, presumably to make them more visible in the evening, and produce a sweet nectar. Bats (and possibly some birds too) collect pollen on their head when they delve into the flower for nectar, transporting it to the next flower as they cruise around the forest feeding. We have to make sure we do by hand what the bats do by head. Work at the National Botanic Gardens at Glasnevin, in Ireland in 2008, showed that a little physical damage to the receptive part of the flower (the stigma) doesn't do it any harm either, and may just help. They also found it was best to cross different individuals to get good seed set. The seed pods are the size of a melon so it's worth returning in a month or so to see a) if we've been able to (gently I assure you) pollinate them again this year and b) what we've done to support these giant pods from bringing down the whole vine!. While we grow some impressive Jade Vine blooms at Kew, I don't know if we can yet say we grow the best in the world. 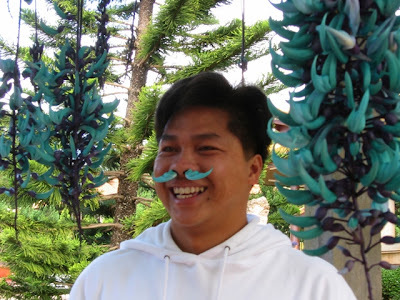 I recall some rather fine specimens in the Tropical Centre in Sydney's Royal Botanic Garden, as well as source of this moustache, outdoors in Dalat, in central Vietnam (a picture I also posted in 2009). There's a great specimen at a caravan park in Cook Town. It covers the roof of the camp kitchen.